Home / Shop / All Books and Music Scores / Coste, Napoléon / Napoleon Coste Composer. A charming small book about Napoleon Coste. Napoleon Coste Composer. A charming small book about Napoleon Coste. This would make a delightful small birthday or Christmas present for someone who is interested in the classical guitar. 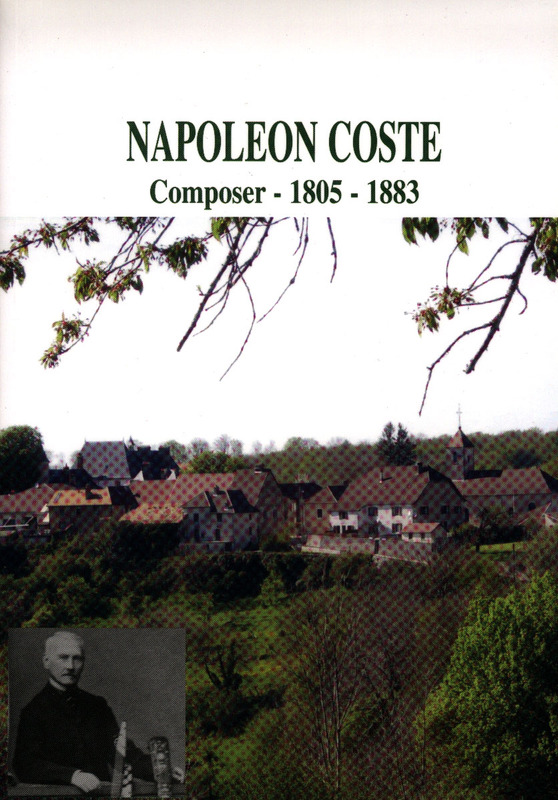 Napoleon Coste Composer is a charming little book in paperback format and 48 pages long. It outlines Coste’s life and work and has many colour photographs, especially of the area of Amondans in the Doubs in France. From the point of view of the historian it is interesting because it includes details of Coste’s career which I have not seen elsewhere, for example reviews of concerts in the “Courrier de Valenciennes” of the early 19th century. This small book was first published in 2005 to accompany the celebrations which were held in Amondans, the village in France where Coste was born, to commemorate the 200th anniversary of his birth there in 1805. The author, Noël Roncet, is the curé of Amondans. Tecla Editions has now republished this book, this time in both French as Napoléon Coste Compositeur (TECLA 121) and also in English as Napoleon Coste Composer (TECLA 122). THIS PAGE IS FOR THE ENGLISH VERSION. Pour la version en français, cliquez ici. For the French version, click here. Copyright 2008 by Tecla Editions. Errors and omissions excepted.